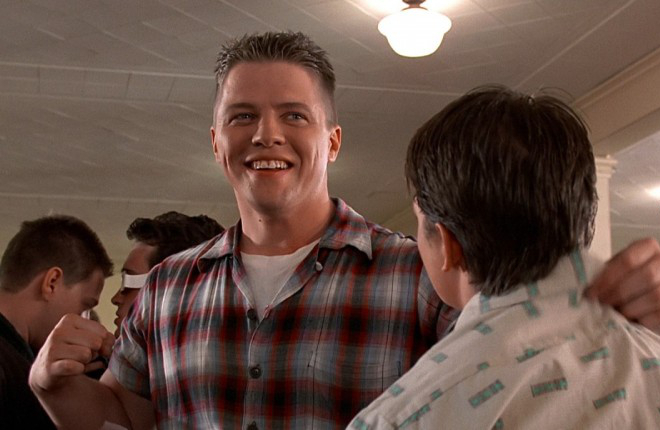 I was once biffed in the stomach by a guy who thought he was a kind of Biff. Actually, he was just a 10 year old boy punching the air out of a 10 year old girl's lungs. Ah, memories. Yes. "Just tell the teacher" is very easy advice to give from an adult's perspective - for a child it's a much harder thing to do. I was about 14. My 7-year-old cousin had taken up kick boxing. He was so enthusiastic about it that he biffed me in the stomach. Oh, the pain and the mixture of emotions, anger and fear that I would have internal bleeding. I don't remember what happened afterwards but I think he got yelled at, because ever since then he has never raised his fists when he's around people. He's now 20. As for being biffed, I can't say that I ever recall anyone purposely biffing me. I did know a boy in junior high who was notorious for "joking around" with me. One day, I had enough! I biffed him - right in the shin! My teacher, who happened to be watching, must have thought he deserved it too because he never said a word! Happy father's day, Ed! Enjoy a day with the family today! Some Father's Day this is turning out to be! The first thing waiting for me when I awoke was an email from the most brazen of bigoted barmy bloggers Nick Number, informing me that it's actually spelt 'just deserts' rather than 'just desserts'. This so-called "Nick Number" (if that is his real name) even brought back-up, citing such sources as Snopes (pff ... who are they?) to suggest that 'deserts' is actually a different word altogether, related to 'deserve', and the use of 'desserts' is a common mistake on account of the fact that both word are pronounced the same. Well indeed, Mr Number: know that I will be retaining my chosen spelling of 'desserts' on this page, as fond as I am of desserts generally, and as deeply entrenched in the syrupy metaphor that that sentence is. However, do note that I have read your blog also, A Vandal's History of Something-or-other, and I've found it to be rife with factual inexactitudes. I have written to complain in the strongest possible terms about your contumacious misuse of the word "desserts". How would it be if we all went our way through the world, hurling about desserts willy-nilly? It would lead to a very sticky wicket indeed. As to the defamatory obloquy you attempt to heap upon my scholarly pursuits, I shall have you know that every single statement I publish is accompanied by a citation of the most unimpeachable nature. To suggest otherwise, with allegations of factual inexactitudes, is to call into question the very value of collaborative encyclopedic endeavor on the Internet. On behalf of all participants, I feel myself very much embiffened by your post, and demand a retraction of your detraction post-haste.